There is nothing more annoying than a constantly running toilet. Water is literally running away, costing you a significant amount of money in excess water usage. So when it happens, fix it immediately. 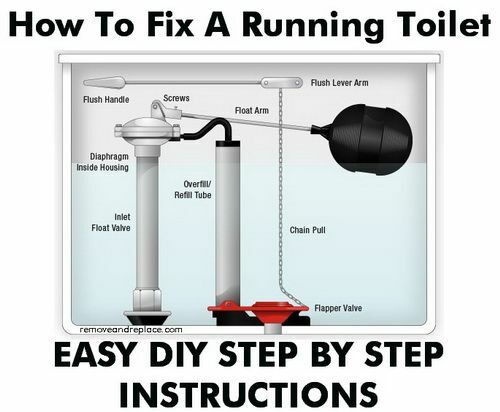 Knowing how to fix a running toilet is a good skill to have, even if you never plan to do it yourself. Understanding how it works will help you know when to call in a professional plumber. You should check your toilet as part of your regular maintenance. Here are the signs that you have a toilet problem. Brown stains. If you see a brown stain at the back of the toilet bowl, you probably have a leak. The easiest way to fix it is by repairing or replacing the washers and ball valve in the cistern. Water dripping or leaking into the toilet bowl caused by faulty or old parts in the cistern. This is normally obvious after you have flushed the toilet, if the water has stopped running, but water is still flowing into the toilet from the top, you have a problem. You have water leaks around the toilet bowl and on the floor. This can happen when the bolts in the cistern have broken. It can be caused by cracks, wear and tear or other damage to the toilet. If the leak is due to a crack or other damage, the toilet will need replacing. You can speak to a plumbing expert for help with the problem. But, the good news is that you can often use basic DIY skills, to solve the problem without professional assistance. The typical reason for a running toilet is a worn out flush valve (or toilet flapper). No longer sitting perfectly on the bottom of the toilet tank, water flows into the toilet bowl instead of filling the toilet tank. By understanding how a toilet works, you can quickly work out how to fix a running toilet and if you have the skills to fix it. Every time you flush the toilet, the toilet flapper is lifted, allowing water to flow from the tank into the toilet bowl. Once the tank is empty, the flapper moves down again, closing off the gap that releases water. As the tank begins to refill, a plastic float, which is located in the toilet tank, starts to rise. This float is connected to the float valve which closes over as soon as the tank is full. You will see that there is an overflow tube in the tank of the toilet. This tube is there to enable water to run off into the toilet bowl, if the water levels get too high. Now that you know the basics about how your toilet operates, you should be able to work out the issues that may cause your toilet to constantly run and how to fix a running toilet. Check that your flapper is in good working order. Using a stick, push the flapper down and listen for the water flow. If it stops, you need a new flapper because it isn't sealing. Check that the flapper is not become hard and brittle. Make sure that the flapper chain is not tangled. Check that the flapper is not jammed in any way. If the flapper is jammed or tangled, simple re-align the flapper so that it opens and closes smoothly. If the flapper is old, hard or brittle, replace the flapper with a new one. Make sure the new flapper is similar to your old one. Once you have a new flapper, shut off the water supply to the toilet, make sure that the tank is empty, then replace the flapper according to the instructions on the packaging. Shut off the water supply valve for the toilet. Make sure that you place a bucket below the water supply hose, and flush the toilet to make sure that the tank is empty. Unscrew the entire float valve assembly. Fit the new valve, making sure that the height is correct for the tank. Re-attach all the water supply lines, making sure that the overfill tube is at the right level. 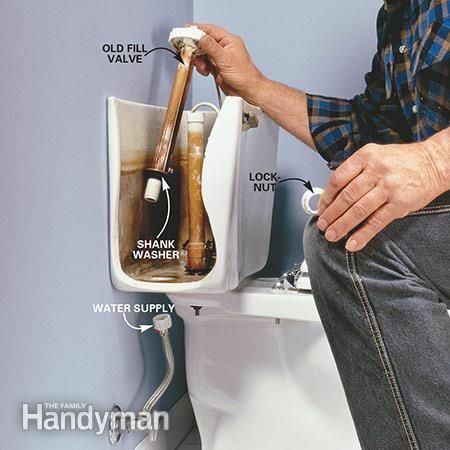 Once you have replaced the broken float valve, the toilet should stop running. There could be a problem with the plastic float itself. Cracks in the float can cause it to become waterlogged, preventing the float from rising and falling. If it's damaged, you should replace it with a new one. All of these issues can be the cause of a running toilet. They are usually simple to resolve and its best to deal with a running toilet as soon as possible. If you are not confident about doing the work yourself, or you simply do not have the time, call a professional help because your running toilet could be the result of something completely different, more expensive and quite complicated.